KALAMAZOO, MI — A new addition for craft beer fans provides a tasty wrinkle to your grocery shopping experience. 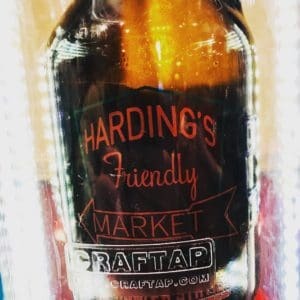 The Harding’s Market at 5161 West Main St. in Kalamazoo recently installed The Growler Station, where shoppers can sample and select a unique craft beer to take home. A Harding’s Market growler is filled at the Kalamazoo location. A growler is a 64-ounce container that is frequently used in breweries around the country. Its 32-ounce and 16-ounce cousins — called howler and yowler, respectively — are also available. “We thought we’d be innovative and bring something to retail that wasn’t here,” Store Director Gary Peoples said. The beer selections change frequently and are typically not beers found in packaged form, or are difficult to find. Peoples said he likes to order specialty beers — mostly from Michigan — that are not packaged in bottles or cans. He’s carried popular beer from Old Nation Brewing Co., including Boss Tweed, KBS from Founders Brewing Co., and hosted tap takeover events for area breweries, including One Well Brewing of Kalamazoo. The beers are displayed on a TV screen with details about each option. There’s also a touch screen on the counter that lets shoppers learn more about the beer, the brewery and a few food pairing tips. A least one hard cider and a root beer is also available, Peoples said. The growler station is located between the produce and beer aisles. Samples are available on request, which makes it convenient for those looking to bring a new fresh beer to share with friends and family while picking up groceries or weekend grill-ables. 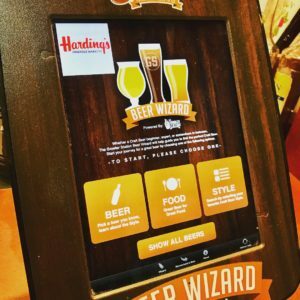 The “Beer Wizard” is a touch-screen menu that shares more details about available beer, the breweries and what food to pair with your selection. The Growler Station started in New York City in 2012. The product uses a counter-pressure filling system with CO2 that purges oxygen from the container, allowing for more efficient pours and beer that stays fresh longer than standard fills, the company says. For more details about The Growler Station at Harding’s, call 269-381-0244. A coupon for a free Harding’s glass growler is available to all guests attending a West Michigan Beer Tours walking tour of downtown Kalamazoo breweries, which run every Saturday in 2018.